It would be hard to argue that Leopard’s Time Machine is not useful, or at least comforting to have around. The built-in backup feature offers a simple, set-it-and-forget-it safety net for the day you might actually need to restore files, but you don’t get much control or even oversight into what actually gets backed up. Sure, you can exclude specific folders from Time Machine’s System Preferences pane, and you can boldly fly through a gratuitous space screensaver while browsing the folders of your backups. But users—especially those who are often confused by unnecessarily lengthy backups—have been asking for a way to view more information about what is being backed up, and how large all these files are. BackupLoupe from soma-zone attempts to answer the call of Time Machine users who are short on time or hard drive space. 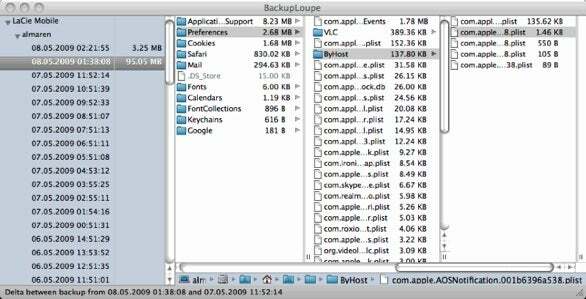 BackupLoupe is basically an augmented Finder-based file browser, displaying a list of your recent backups, the size of each backup, and a Column file browser with the bare essentials: file names and sizes. You can even use Quick Look to view files from your Time Machine backup while you browse. After using BackupLoupe to sniff around your Time Machine backups and find what’s hogging up all the space, you can drag those files or folders to the System Preferences pane for exclusion. Don’t forget that you can also reclaim previously used space by permanently deleting previous versions of those files and folders while browsing in Time Machine. BackupLoupe costs €1 (or about $1.40), and a free demo is available from soma-zone’s site.